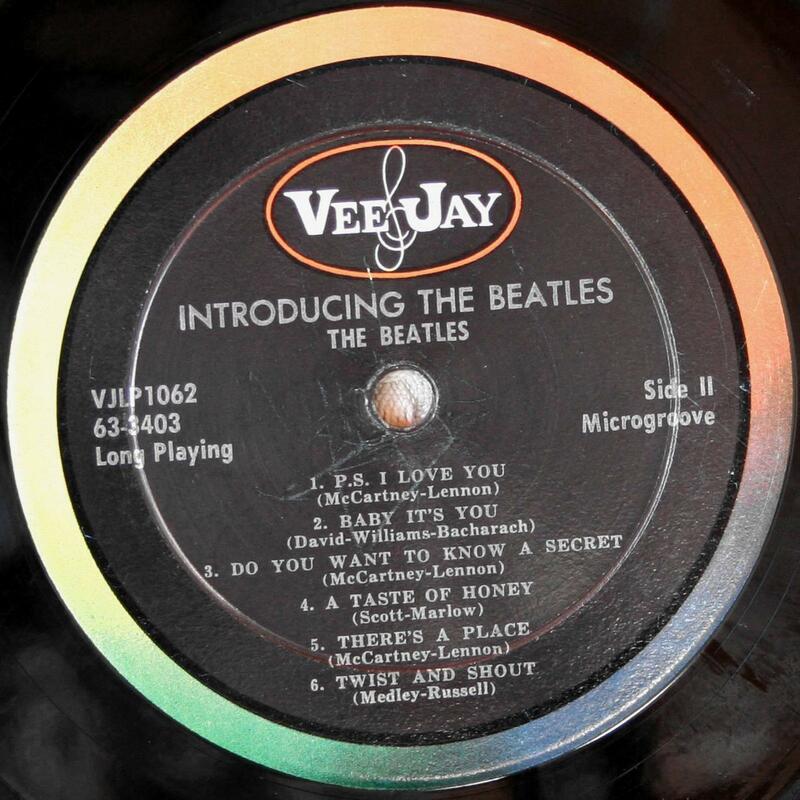 The Beatles Collection » Introducing The Beatles, Vee-Jay VJLP 1062, Record Variations (Version One). 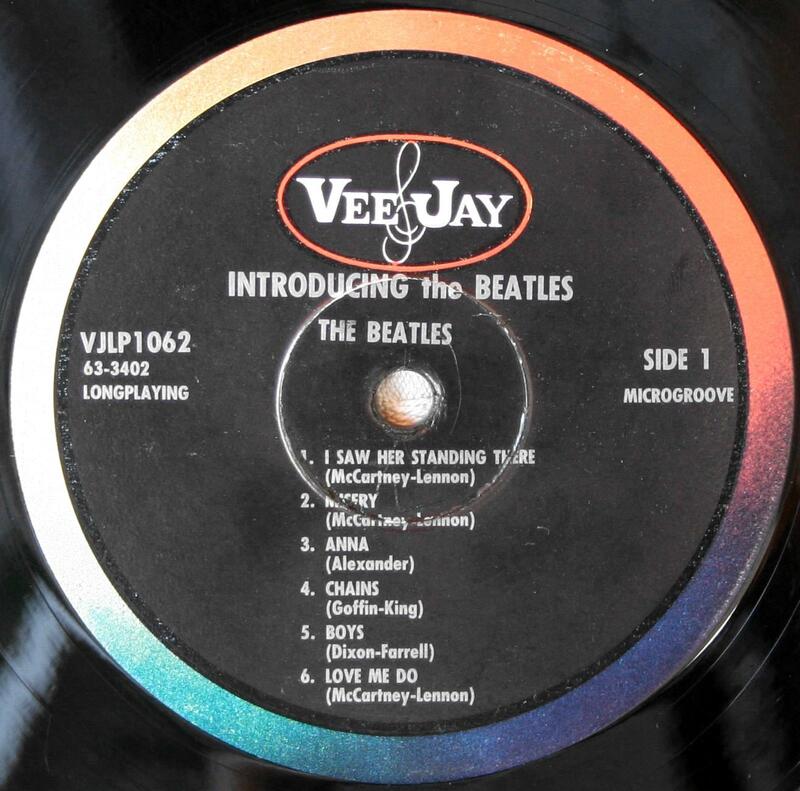 Introducing The Beatles, Vee-Jay VJLP 1062, Record Variations (Version One). 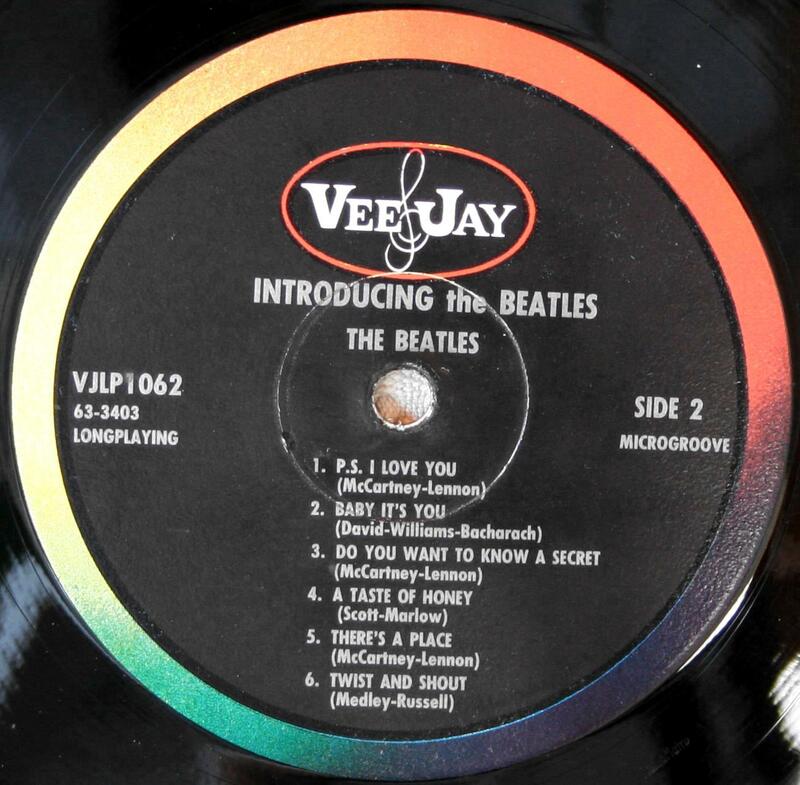 As with all Beatles records on Vee-Jay, there are multiple label variations for this historic album. This is because the records were manufactured at different regional pressing plants. 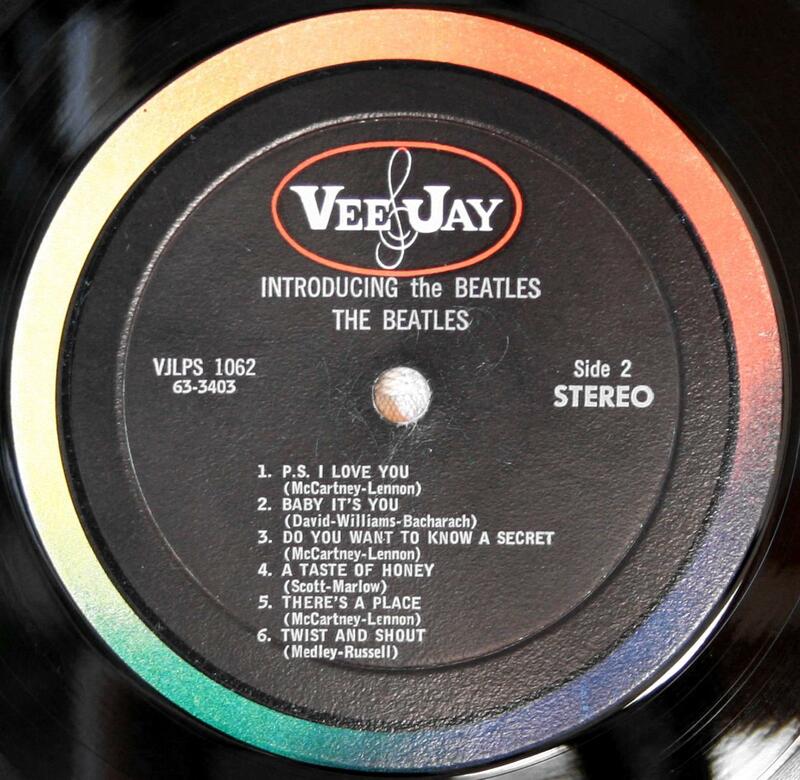 Exhibits filed in Vee-Jay’s New York litigation with Capitol indicate that stampers were initially sent to the same factories that produced the Beatles 1963 singles: ARP, Monarch, Southern Plastics and later ARC. The most common mono record label variation has a black label featuring an outer rim colorband and the oval logo. There are three typesetting variations. Tipeset by ARC on these black label backdrops with the outer rim colorband and white brackets logo. 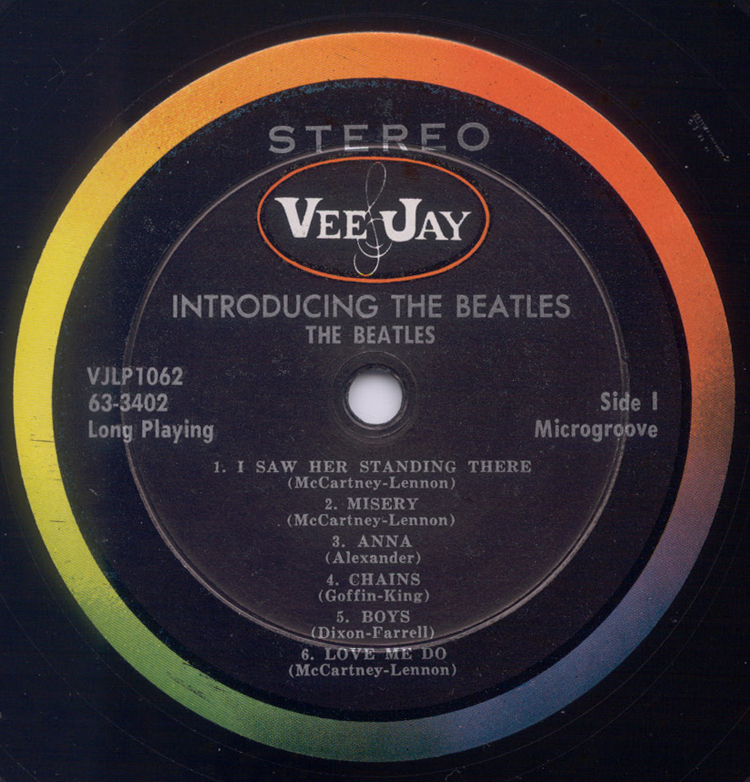 All stereo versions has a black label with an outer rim colorband featuring the oval logo. 1. Mono. 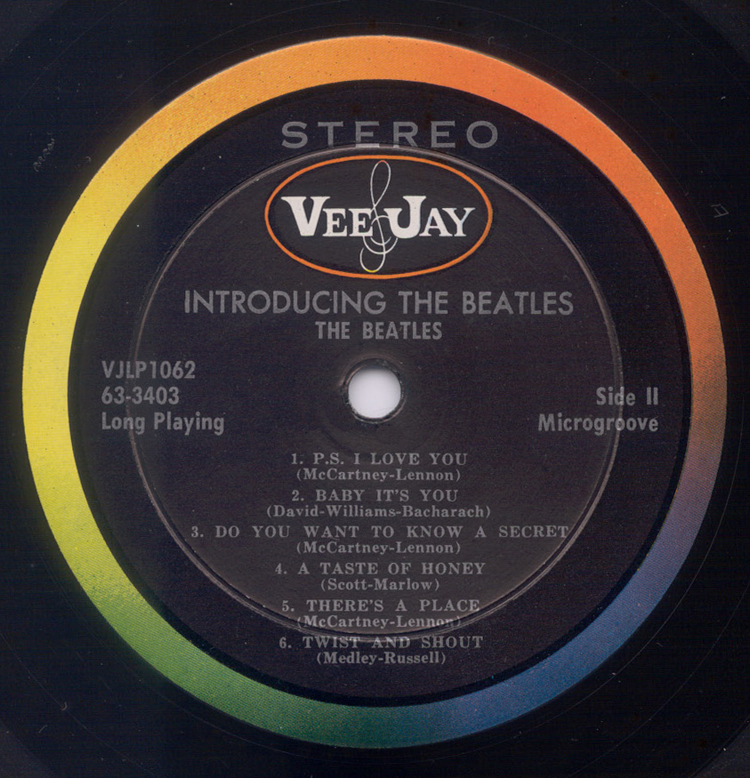 Mono label has centered song titles and songwriters’ credits with “INTRODUCING THE BEATLES” in medium print and “Long Playing” and “Microgroove” on the label. The trail off areas have the hand etched matrix number 63-3402 on Side I and 63-3403 on Side II. Both sides have the hand etched initials “RA” and “A” as well as the machine stamped Audio Matrix and “ARP” logos. This variation was pressed by ARP. 1. Stereo. Stereo label has the exact same typesetting and information as mono with the word “STEREO” at 12 o’clock. The trail off areas have the hand etched matrix number 63-3402S on Side I and 63-3403S on Side II, which also has the hand etched date 6-28-63. Both sides have the hand etched initials “RA” and “A” as well as the machine stamped Audio Matrix and “ARP” logos. This variation was pressed by ARP. 2. Mono. 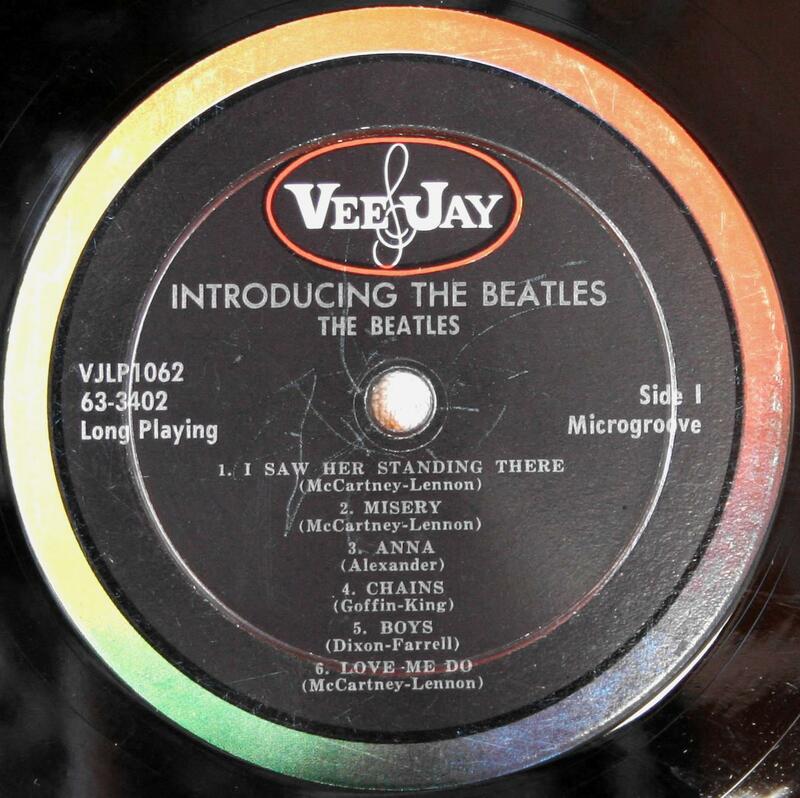 Mono label has left justified song titles and songwriters’ credits with “INTRODUCING the BEATLES” in small print. The words “Long Playing” and “Microgroove” do not appear on the label. The trail off areas have the hand etched matrix number 63-3402 and job number 5702 on Side 1 and matrix number 63-3403 and job number 5702-X on Side 2. Both sides have the hand etched date 6-29-63 and initials “RA” and “A” as well as the machine stamped Audio Matrix and “MR” logos. This variation was pressed by Monarch Records. 2. Stereo. 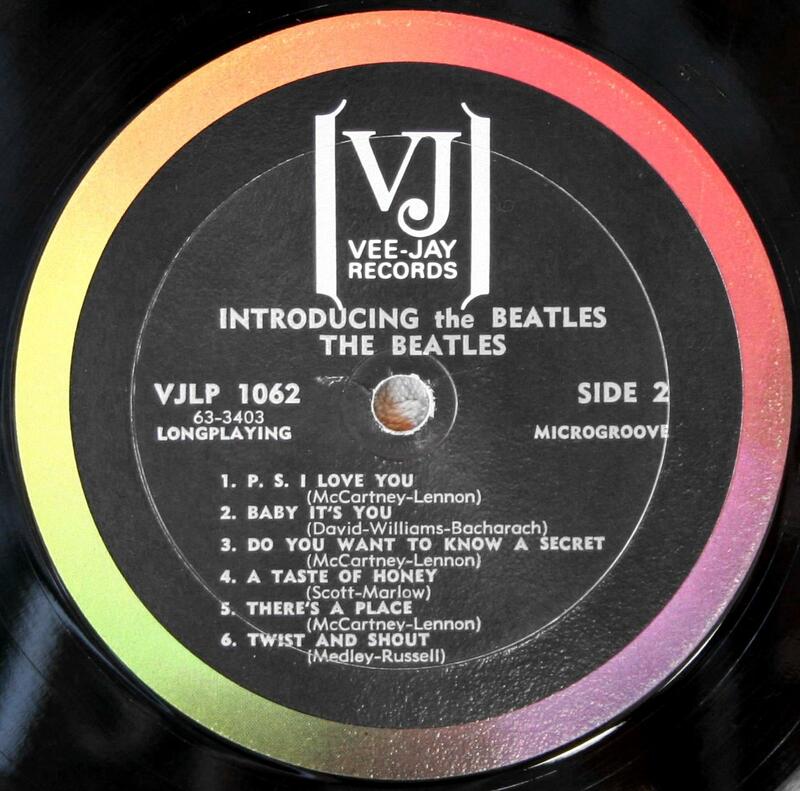 Stereo label has the exact same typesetting and information as mono except that the album number is VJLPS 1062 rather than VJLP 1062 and “STEREO” appears at 3 o’clock below the Side number. The trail off areas have the hand etched matrix number 63-3402S and job number 5689 on Side 1 and matrix number 63-3403S and job number 5689-X on Side 2. Both sides have the hand etched date 6-28-63 and initials “RA” and “A” as well as the machine stamped Audio Matrix and “MR” logos. This variation was pressed by Monarch Records. 3. Mono. 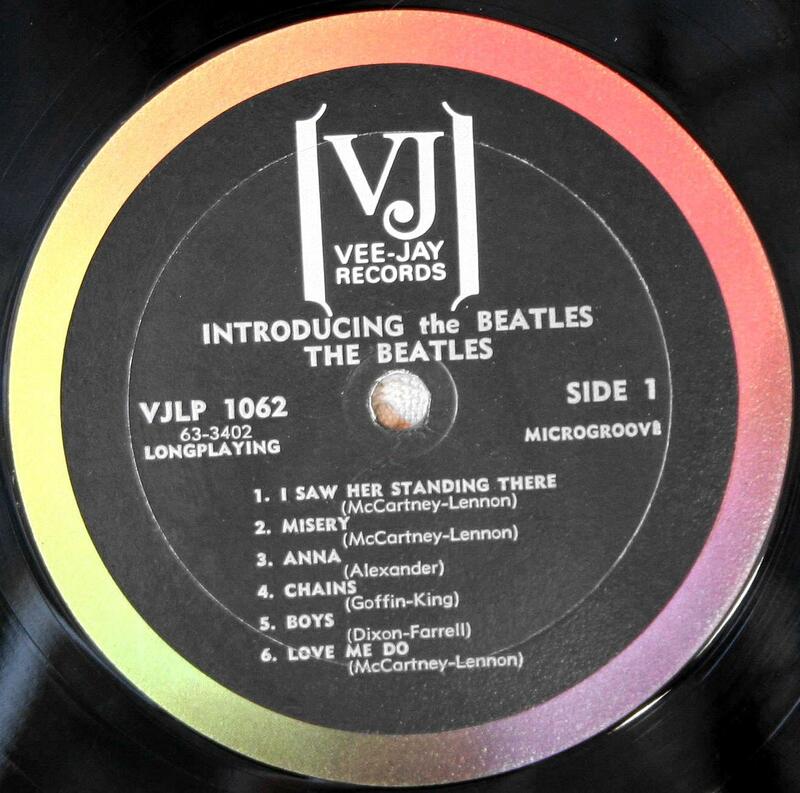 Label has left justified song titles and songwriters’ credits with “INTRODUCING the BEATLES” is in medium print and the words “LONGPLAYING” and “MICROGROOVE” appear on the label. 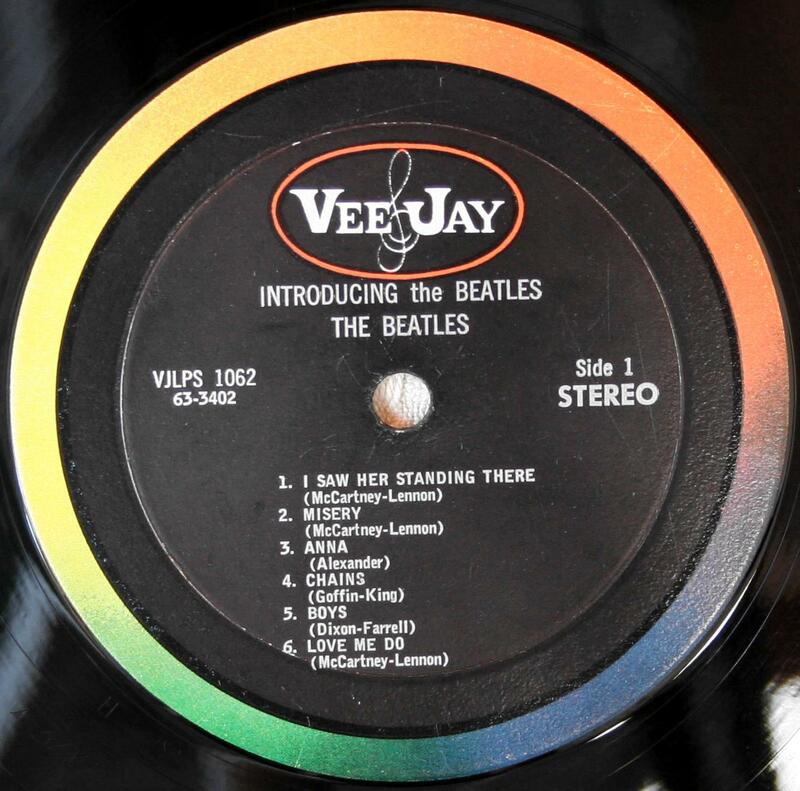 The typesetting on the labels has an amateurish appearance as “THE BEATLES” is not level, particularly noticeable on Side 1. Its trail off areas have hand etched matrix numbers as well as the date 6-29-63 and the initials “RA” and “A”. The machine stamped Audio Matrix logo is also presend. This variation was pressed by Southern Plastics. Its is not know if Southern Plastics pressed stereo Version One records. 4. Mono. This record label variation has a black label backdrops with the outer rim colorband and white brackets logo. 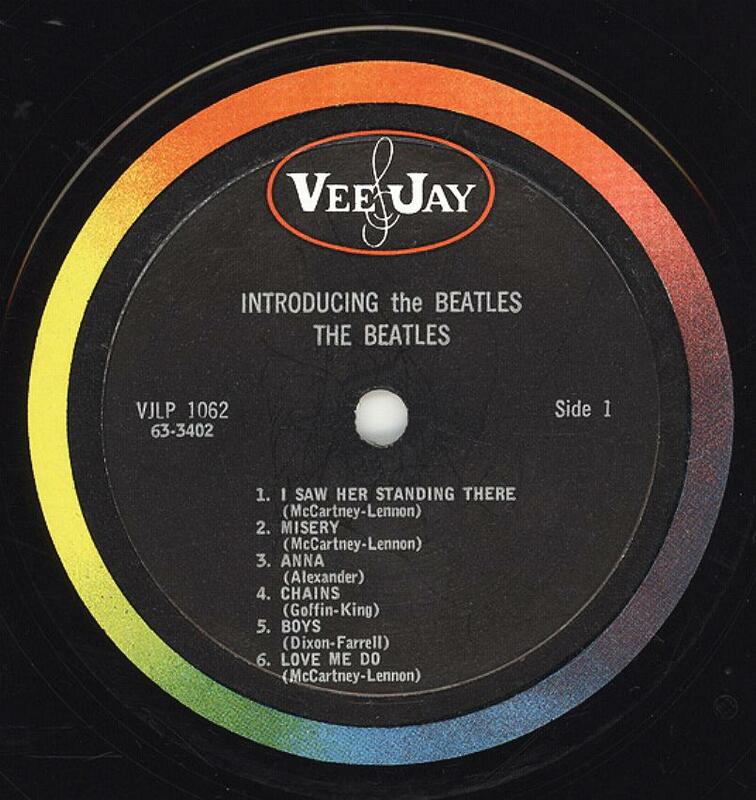 Label has left justified song titles and indented credits with “INTRODUCING the BEATLES”, “MICROGROOVE” and “LONGPLAYING”. Trail off areas contain the following hand etched markings: “AB”, the matrix numbers 63-3402 and the date 1-10-64 on SIDE 1; “A11”, the matrix number 63-3403 and the date 1-11-64 on SIDE 2; and “ARC” on both sides. The Audio Matrix logo is also clearly visible on both sides. This variation was pressed by ARC. 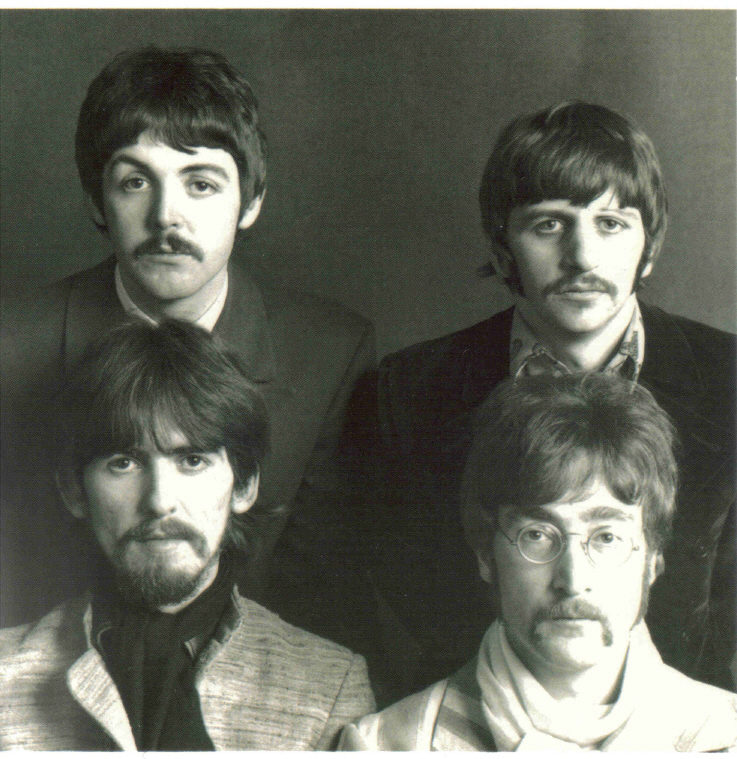 ARC records represent only about 6% of the total mono Version One records pressed. ARC is not manufactured stereo Version One records.